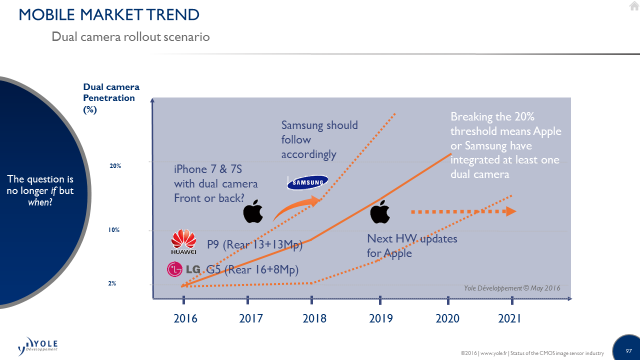 Yole Developpement publishes it analysis of the impact of Apple's dual camera on the industry "What are the key lessons learned from Apple’s recent introduction of dual cameras? And where are we headed?" "The first take-away from Apple’s dual camera strategy is the successful introduction of the technology. The response of consumers has been positive, even though we are still wondering if significant performance improvement is achieved by the approach. However, dual camera technology is improving the current usage of photography by bringing new performance elements, such as the blurry aesthetic of bokeh, high resolution black and white, or optical x2 zoom operation in daylight. Performance is broadening, rather than focusing on a few indicators like pixel count and low light capability. Another key aspect of the successful introduction is the status symbol it brings to adopters. Dual cameras are a visible attribute that can be linked to the slim form factor of high-end smartphones. The second take-away is the increased revenue this approach is bringing to the smartphone industry. The dual camera setup necessarily doubles the number of imagers, their packaging, and eventually autofocus (AF) and/or OIS devices. The total cost for smartphone cameras has escalated toward the $22-$24 range, around 10% of the total smartphone manufacturing cost. The additional camera volume will fuel 10.4% global revenue growth rate we forecasted for the CIS Industry for the 2015-2021 time frame." Yole wrote : "The dual camera setup necessarily doubles the number of imagers, their packaging, and eventually autofocus (AF) and/or OIS devices." Firstly, Samsung S8 won't have a dual camera set up, neither will HTCs next flagship, so I don't think they have much of an influence, meanwhile Huawei and LG were already doing dual-cam. Secondly, only the main wide-angle camera on the iPhone 7 Plus has OIS so I'd say it doesn't double OIS sales.